There are a lot of pictures starting to circulate about the prototype walls being constructed and considered, but most of them tend to focus on the prototypes themselves and don’t show the surrounding context very well. 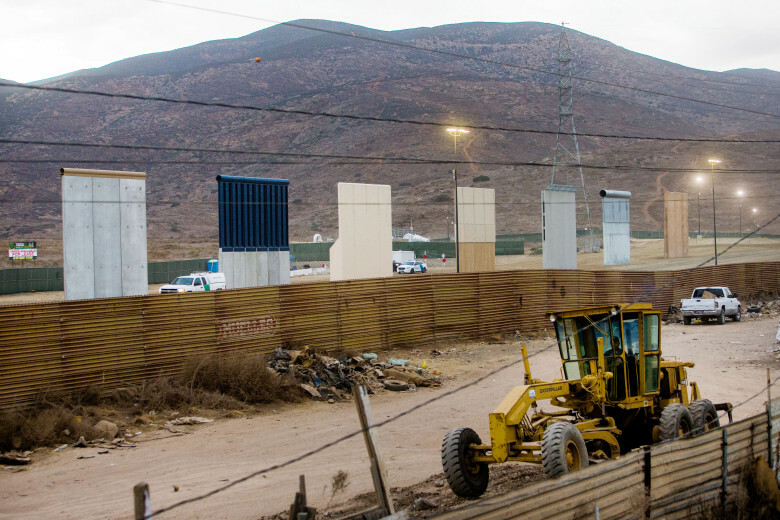 The main image for an article today in the Press-Enterprise shows the border wall prototypes in context with the existing fence/wall separating the US from Mexico. In it, one can see the new prototypes in the background while we see the rusty old fence in the foreground. Does the existing fence seem imposing? 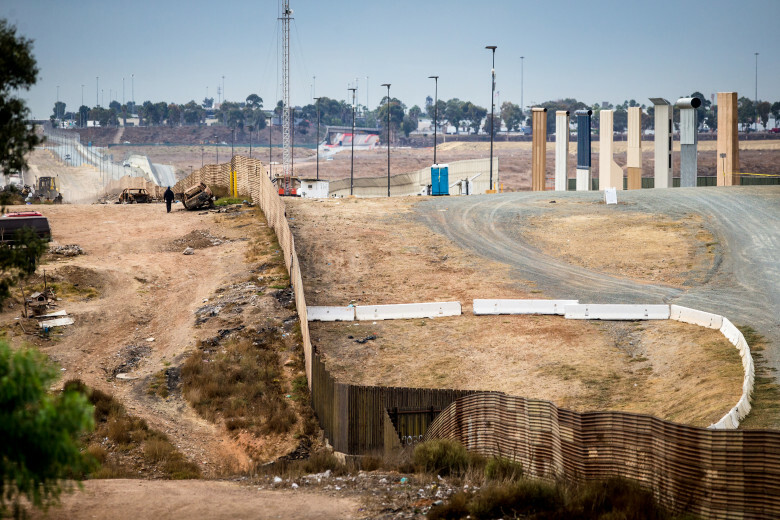 Does the existing fence in any way seem an impediment to illegal crossing, or in the very least does it seem to impede throwing any contraband one may want over to the other side? If anything, seeing this angle has convinced me even more how in at least this area more needs to be done, and soon. Thirty feet tall suddenly doesn’t seem that high. Areas that are heavily populated present different challenges than the ones in desolate areas. In urban and suburban areas like this, one thing that a tall wall will do is afford first responders time to get to an incident of crossing before the perpetrators have time to clear the area, because crossing a 30-foot wall takes longer than crossing the fence shown here does. The wall or fence shown here doesn’t intimidate anyone. Nobody needs a plan on how to get across, or any special equipment. You just cross it. 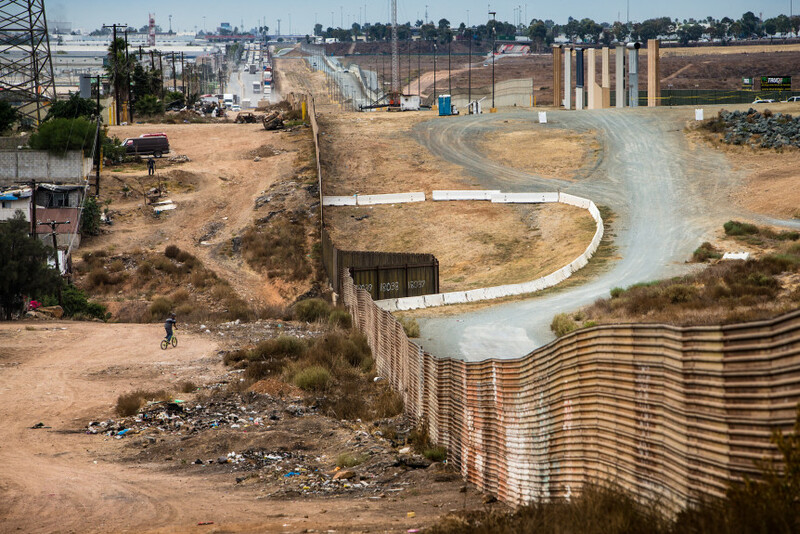 The border-wall prototypes in San Diego are in front of the Las Torres and Rancho Escondido colonies along an area of Tijuana where a 10-foot corrugated metal wall already exists. Homes, parking lots, dumped waste and burned cars line this border region. The sample sections — made of concrete, thick metal poles, and other materials — were completed in late October near the Otay Mesa border crossing. One wall has a grey surface textured with patterns of different-sized bricks. A steel plate sits atop with metal spikes. How could they possibly view any of these designs as a visual downgrade from what’s already there? They mostly remind me of the highway sound barriers we’ve got now alongside most highways in urban areas. 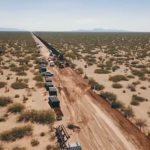 The other argument being made – and this is a wise one to try – is that because the proposed wall won’t stop 100% of crossings it’s not worth doing, or it’s thus ineffective. One can see at a glance, thanks to the photos here, the impact the new wall will have. They’re tall enough to be intimidating. It will no longer be a matter of pulling your car up next to the wall, jumping on the roof, and hopping over (as the white pickup so handily illustrates above). Jumping down from the top of the 10-foot wall (or hang-dropping) is trivial; doing the same from the top of the 30-foot wall practically guarantees serious injury. The upgraded sections shown above will clearly make a difference in comparison to the wall in the foreground at stopping day-to-day crossings by average people, and turn a basic delivery of drugs and contraband into an effort that requires significant planning and coordination. By turning a deluge into a trickle, the Customs and Border patrol first responders will be better able to interdict those few, determined individuals who do attempt a crossing.